Give A Gift To The Planet! recommended in the October 2018 Intergovernmental Panel on Climate Change report. STANDLEY CREEK RESTORATION—The Final Two Phases—Historic habitat for threatened coho, Chinook salmon and steelhead trout, Standley Creek is a critical fish-bearing tributary of the South Fork Eel River. This creek was destroyed for salmon by years of industrial logging which resulted in siltation from roads and dams from collapsed log bridges. Your gift provides the matching funds for completing the final phases to improve habitat and open streams for fish migration. SOUTH FORK EEL RIVER RESTORATION FOR COHO RECOVERY—The South Fork Eel River is one of Northern California’s most important salmonid rivers. In 2014, RFFI completed a comprehensive Coho Recovery Plan, and this fund begins implementation of that plan to restore coho salmon habitat to the South Fork. USAL CREEK COHO RECOVERY—The Usal Forest’s other watershed is also prime habitat for threatened coho salmon and steelhead trout. The creek and its anadromous fish populations have shown resilience in spite of a variety of land use impacts since the late 1800s, including heavy logging and road and rail construction. Now we need your help to fund planning and restoration which applies Department of Fish and Wildlife-approved techniques to systematically identify address sources of sediment and runoff-related problems for fish passage. HERBICIDE-FREE FOREST MANAGEMENT—RFFI is experimenting with a three-year moratorium on chemical herbicides to remove over-grown hardwoods that compete with redwood seedlings for space, water and light. Hardwoods pose one of the biggest challenges to redwood growth in Northern CA and the traditional solution is herbicides. RFFI is using manual brush removal – ecologically-superior but 3 to 5 times more expensive. Please invest in “least-toxic” methods to protect fish and water supplies. BUILDING THE FOUNDATION—Your gift to RFFI has tremendous leveraging power. For RFFI’s programs to have local & global impact, we need to develop new partnerships and grow. Help RFFI build capacity to conduct restoration, manage the Usal Forest in an ecological and community-building manner and achieve our long-term goal of opening Usal to the public. 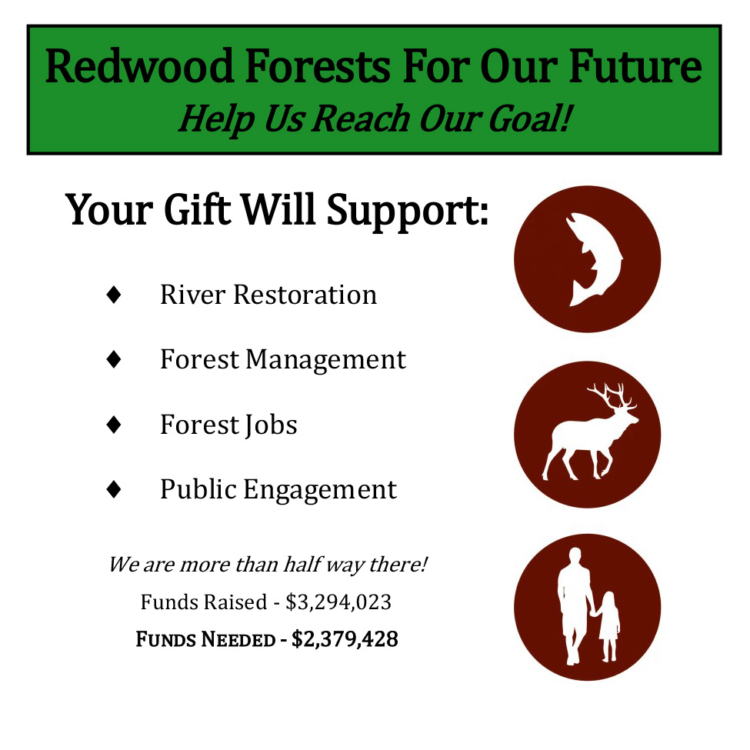 Support programs such as NORTH COAST BIOCHAR, crucial to our vegetation management and our highly successful redwood reforestation project, Plant a Redwood Now! In 2015, RFFI and the Cahto Tribe are initiating a partnership to conduct restoration projects that provide jobs in the forest for tribal members and help them acquire the skills needed for future forest-related professions. This program has great potential for expansion to other tribes and the wider community. MCCOY CREEK PROPERTY DEVELOPMENT—The 220-acre McCoy Creek property is the only developable Usal site along Highway 101. With easy public access, McCoy Creek is an ideal site for an education center for youth and adults. It will also serve as access point for Usal and an area where we can interpret RFFI’s unique forest management approach. Help us begin initial development of the premier site.